As the Oilers prepare to say farewell to Rexall Place on Wednesday, April 6, they were given a chance to see inside Rogers Place earlier this week. 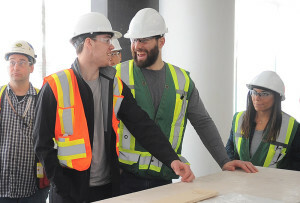 “It’s crazy how far it’s come along,” remarked defenceman Darnell Nurse as he joined the tour through Rogers Place on Monday, April 4. It has been just over a year since the Oilers last set foot in Rogers Place, revealing to them yet another glimpse of the team’s future home. The last time the team toured Rogers Place, only a steel framework laid in place. Now, with electrical and drywall installed, the players did not have to rely as heavily on their imaginations when envisioning where they would be spending next season. “(Rogers Place) is going to be a great common grounds for everyone to meet before games, after games, come here for concerts…” observed Matt Hendricks. As the team made their way through the Winter Garden, along the main concourse and into the stands, they had countless questions for their PCL tour guides—giving way to their excitement. “(The players) had lots of great questions about the technology in the building and lots of great questions about the fan spaces in the building,” commented Bob Black, Chief Project Development Officer, Oilers Entertainment Group. With nearly a thousand workers operating the construction site daily, the rate of change that has been occurring inside Rogers Place is insurmountable. “The construction is moving with great rapidity and tremendous efficiency,” Black added, as the building is fast-approaching its completion date. A recurring theme continues to emerge amidst the construction of Rogers Place. That theme is attention to details. “There were a number of indications of ‘wow, you guys thought of everything’,” Black responded when asked what the reactions were amongst the players. As details behind the construction of Rogers Place are gradually being unveiled—outlining the building’s exceptional design and cutting-edge technology—excitement continues to grow for both the fans and the players. “I definitely look forward to September,” grinned Hendricks. Although the team recognizes and admires the history that has been captured inside of Rexall Place, they are eager to create new memories for the fans to share inside Rogers Place for years to come.